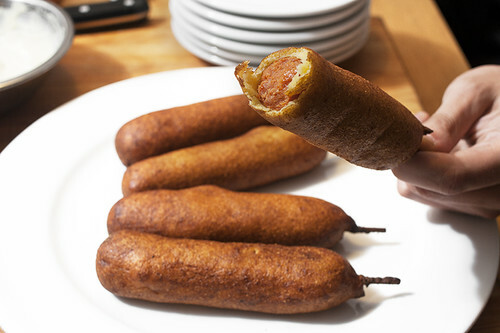 linguica corndogs with poached garlic dijonaisssssse, originally uploaded by aarn! +9th September, 2011+. mixed 3/4c. buttermilk, 2T. light cream, and 1 egg into 1-1/4c. cornmeal, 1/2c. all-purpose flour, 2T. sugar, 1t. salt, and 1t. baking soda. let stand for 10-min or so. poked some linguica sausage links (gaspar’s linguica franks) with bamboo skewers (cut down to fit into the sauce pan containing the hot oil). patted the links dry (the batter sticks better) then dipped/rolled in the batter until lightly coated, then fried one at a time in a sauce pan with 350-degree vegetable oil, until brown. held in a 200-degree oven until all of the corndogs were done. plated with some mayonnaise whipped with smooth spicy brown mustard and poached garlic paste - to taste. these were so good. not even funny. so easy. so good. hello, fat/death.